Table tennis is the world's largest participation sport, with an incredible 40 million competitive players and countless millions more playing recreationally. Leading players hit the ball at speeds up to 160 kilometres per hour using rubber-coated wooden and carbon-fibre rackets. A variety of glues and rubber compounds can be applied to the rackets to impart greater spin or speed, and some glues are banned from the Olympic competition because they make the ball travel up to 30 kilometres per hour faster. With shots named the kill, the hit and the chop, modern table tennis is a far cry from the genteel, after-dinner alternative to lawn tennis played in 1890s England with cigar-box lids for rackets and a carved champagne cork for a ball. The sport made its Olympic debut at the Seoul Games in 1988 and there are four events: men's singles and doubles and women's singles and doubles. The top 16 seeds advance straight into the main singles draw, while another 48 players compete in a qualification round for the other 16 places. The main draw is a single-elimination tournament and matches are the best of five games. Semi-finals winners go on to play for gold and silver medals, with the semi-finals losers playing for bronze. Doubles follows a similar format, but 32 teams are involved. There are various psychological ploys used in table tennis to gain the upper hand, despite a strict code of conduct that penalises unsporting behaviour. Staring out opponents or delaying the action by towelling off and tying shoelaces are all common tactics. The Chinese have been close to invincible in Olympic table tennis, winning an astounding 16 of the 20 gold medals awarded between 1988 and 2004. Tiny Deng Yaping made a big impact on the women's events at the 1992 Games in Barcelona, teaming up with Qiao Hong to win the doubles title and, two days later, defeating Qiao in the singles final. Deng and Qiao defended their doubles title in 1996, and Deng earned her fourth gold with victory over Chinese Taipei's Chen Jing, who had won gold in the singles in 1988 when representing China. In 2003, Deng was elected Chinese athlete of the century. Liu Guoliang became a double Olympic champion in men's table tennis at the 1996 Atlanta Games, winning the doubles with Kong Linghui and the singles. He failed to defend either title four years later in Sydney, but did take bronze in the singles and teamed up with Kong once more to take silver in the doubles. Tennis was included in the first modern Olympics in 1896, but was dropped from the programme after 1924 amid turmoil over issues such as where to draw the line between amateurism and professionalism. It did not return as a medal sport until 1988, but now all of the world's leading professional players are eligible. Andre Agassi has won the men's singles, while the impressive list of winners of the women's singles includes Steffi Graf, Jennifer Capriati, Lindsay Davenport, Venus Williams, Justin Henin-Hardenne. 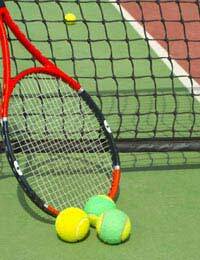 There are four events - men's singles and doubles and women's singles and doubles - all decided by knockout competitions. Mixed doubles is not part of the current programme, although it has been included in the past. Semi-finals winners play to decide the gold and silver medals, with semi-finals losers playing for the bronze.